As many as 1500 Australians each year suffer glass-related injuries. Many victims don’t realise till after the event that the injury could have been prevented with safety film. With modern buildings and homes using large amounts of glass, it is important to consider the potentially fatal risks of not having adequate glass protection. Many buildings built before 1989 do not meet Australian safety standards (AS1288 & AS2208) for human impact safety glazing, exposing families and children to serious injury. Even though the standard was introduced in 1989 the changes were not retrospective and there has been little effort to upgrade glass in existing homes and buildings. 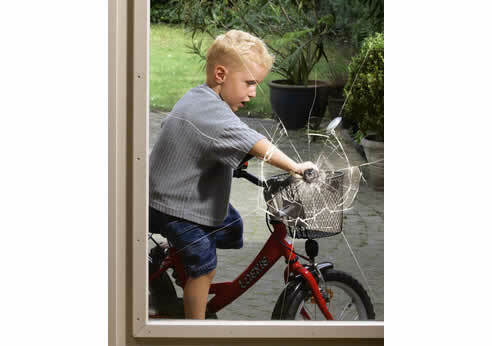 3M Scotchshield Safety film is an ‘organic coating’ that can be retrofit to existing glass and can minimize the risk. It is a quick, easy and cost effective way of upgrading your glass without the need for costly replacement of windows. In areas where there is existing safety glass, 3M Scotchshield films can further reduce the risk by putting an optically clear, distortion free barrier between you and what could potentially be a serious injury from broken glass. Paragon are experts in glass tinting. We take glass safety seriously and can offer you a variety of solutions in addition to safety film. We can also provide safety strips, vision strips and vision decals. These can range from a simple narrow strip across the window, through to dots and lines, and even company logos or graphics. A Paragon representative can perform an onsite inspection and determine if your glass complies with the latest standard. We can also provide a free no obligation quotation to protect your windows. In high impact areas, glass is a potentially deadly safety hazard. More and more institutions expect an even higher standard when it comes to safety glazing. Especially in Daycare or childcare centres, government buildings and multi-national corporations. One example is the NSW Department of Community Services (DOCS) which passed a new Children’s Service Regulation requiring that from September 2004, all new facilities must meet higher safety glass requirements due to the obvious potential hazards involved in these centres. Residential and general use buildings – Grade A safety glass required where the part of the window is less than 500mm from the floor. Gymnasiums, Swimming and Spa Pools, Halls, Public viewing galleries, Stadiums etc (High risk of human impact) – have a Grade A safety requirement. Doors and general application – All doors and any glazing within 2000mm of ground floor level of all buildings are considered subject to risk of human impact and have a Grade A safety requirement.